Isn’t it encouraging to know that we are never alone? 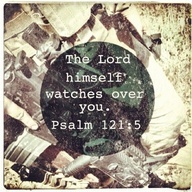 Despite circumstances in life, we have a God who loves and watches over us! I find solace in these verses. To me it brings to mind a sovereign God who cares about me and wants to provide and protect me. He wants to do that for all of us if we allow Him to. This wonderful provision and protection comes straight for the source of all life, and if He says that He will not let our feet slip then we are armed with the best and the strongest! God can do this for all of us today! He wants us to know that He is there for us and that He is watching over our lives. Find comfort in these verses today, and celebrate His care and love through the way that you live it!